The facial nerve resembles a telephone cable and contains 7,000 individual nerve fibers. Each fiber carries electrical impulses to a specific facial muscle. Information passing along the fibers of this nerve allows us to laugh, cry, smile, or frown, hence the name, “the nerve of facial expression.” When half or more of these individual nerve fibers are interrupted, facial weakness occurs. If these nerve fibers are irritated, then movements of the facial muscles appear as spasms or twitching. The facial nerve not only carries nerve impulses to the muscles of the face, but also to the tear glands, to the saliva glands, and to the muscle of the stirrup bone in the middle ear (the stapes). It also transmits taste from the front of the tongue. Since the function of the facial nerve is so complex, many symptoms may occur when the fibers of the facial nerve are disrupted. The anatomy of the facial nerve is very complex. The facial nerve passes through the base of the skull in transit from the brain to the muscles of facial expression. After leaving the brain, the facial nerve enters the bone of the ear (temporal bone) through a small bony tube (the internal auditory canal) in very close association with the hearing and balance nerves. 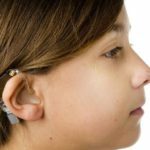 Along its inch-and-a- half course through a small canal within the temporal bone, the facial nerve winds around the three middle ear bones, in back of the eardrum, and then through the mastoid (the bony area behind the part of the ear that is visible). After the facial nerve leaves the mastoid, it passes through the salivary gland in the face (parotid gland) and divides into many branches, which supply the various facial muscles. The facial nerve gives off many branches as it courses through the temporal bone: to the tear gland, to the stapes muscle, to the tongue (for taste sensation), and to the saliva glands. Bell’s palsy and other causes. Determines if the cause of damage to the nerve has involved the hearing nerve, inner ear, or delicate hearing mechanism. Measures the eye’s ability to produce tears. Eye drops may be necessary to prevent drying of the surface of the eye (cornea). CT (computerized tomography) or MRI (magnetic resonance imaging) determine if there is infection, tumor, bone fracture, or other abnormality in the area of the facial nerve. Patients with permanent facial paralysis may be rehabilitated through a variety of surgical procedures including eyelid weights or springs, muscle transfers and nerve substitutions. Some patients may benefit from a special form of physical therapy called facial retraining. Other medical treatments for complications of facial paralysis including excessive motion of the face or muscle spasm may involve surgical division of over-active muscles or weakening them by chemical injection. If these procedures are needed, your physician will discuss them with you. Disorders of the facial nerve including paralysis are not rare and have a variety of causes. The appropriate diagnosis and treatment are very important to achieving the best possible recovery of facial nerve function. Even patients with permanent facial nerve injury can be helped by surgical procedures designed to improve nerve function.